Cilantro needs some clarification. The leaves are called “cilantro”, also known as Chinese parsley. The ripe seeds are called “coriander”. That’s if you live in the U. S. The roots are called coriander root OR cilantro root. All three plants parts- root, leaf and seed taste very different . The root has a peppery quality. The seed is citrousy and the leaves have a pungent odor that is either loved or hated. Coriander was routinely sealed in the burial tombs with royalty for an afterlife snack. Best served with corn chips but good with tortilla chips also. Their beautiful color makes a great natural food coloring when cooked with or added to other foods. Throughout the years I’ve used beet juice for coloring Easter eggs, frosting, drinks and punches. Raw beets make great paper stampers for kids and face makeup (lipstick and blush). When cooking beets steaming or roasting retains the most nutrients. When using in soups, acid intensifies the color (lemon juice, vinegar). Salt dulls it and should be added at the end of cooking. They’re known as “beetroot” outside the U.S. and I was surprised to find a fat slice of cooked beetroot a standard item on a fast food type “Whopper” in Australia. In a large stockpot or slow cooker, combine all . Cube or julienne all vegetables. Cover all with water and cook until tender. Add salt to taste. Serve with a large dollop of sour cream on each serving. Note: beets are easier to cut up and peel (if necessary) if they are precooked. It is fun to watch the young chickens running and jumping into the air to catch whichever insect flies into their paths. All insects are fair game, except the wooly bear caterpillar. When these caterpillars wander into the chicken’s path of danger the prickly caterpillars remained unscathed. I’m not sure if it is the prickles on them or maybe the chickens share many farmers belief that these caterpillars are a predictor of how harsh the winters will be. The caterpillars have black rings on the outside and a reddish brown one in the middle. It is believed that the larger the red ring is the milder the winter we are suppose to have. All the caterpillars that escaped sudden death had large red rings, which means we are suppose to have a mild winter. The chickens and the farmers will like that, since during the winter the chickens refuse to wander outside when there is snow on the ground. Each snowy day they patiently wait and look outside their small chicken door until we shovel a path for them. Once the snow is removed they will venture outside. Maybe this year we can give the snow shovel a rest. What to do with turnips. Carving your turnip for Halloween? Turnips were the original Jack O’ Lantern. Pumpkins didn’t enter the picture until the settlers here in the New World discovered that pumpkins worked much better. 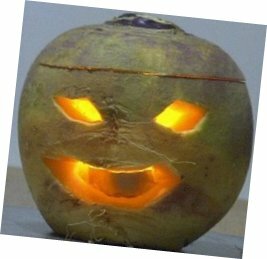 The Irish started the turnip tradition to scare Jack of the lantern away as well as evil spirits. Just hollow out your turnip , add a face , a candle and let it stand guard on your porch. You go first and let me know how it went. I’ll make the soup. This is a Moroccan dish that is impressive and easy in spite of the long list of ingredients. Cook for 3 minutes Add spice mixture. Cook for 1 minute stirring constantly. Simmer uncovered for 40 minutes or until lentils are tender. Serve over hot cooked couscous. Select firm, white turnips or the rutabaga, a large yellow variety. Wash and pare, cut in slices and throw into boiling salted water. Cook uncovered, just below the boiling point until tender. Drain and shake a moment over the fire until dry. Press through the potato ricer or mash and season with salt, pepper, butter and cream. Heap in a vegetable dish with a dash of paprika on top and serve very hot with duck or mutton; also very nice with roast pork or spare-ribs. Recipe from 1908 cookbook. Rosemary is native to Mediterranean coastal areas and that’s where it gets its name. It’s botanical name means "dew of the sea’’. Folklore always associates rosemary with memory in some way- as an aide to help students, as a funeral flower so the loved one would not be forgotten, at a wedding so the bride would remember her vows. (no mention of the groom). An interesting use for stiff sprigs is as a basting brush when grilling. It can be used as an herbal tea, and especially compliments root vegetables. Preheat oven to 450 degrees. Toss all ingredients in a roasting pan . Roast for about 20-30 minutes until browned , stirring occasionally. Preheat oven to 325 degrees. Grease a 10 inch loaf pan. In a mixing bowl, beat eggs and sugar until foamy and pale yellow. Add lemon juice and rosemary. Slowly drizzle in the olive oil. In another bowl whisk together the dry ingredients and add to the first bowl mixing slowly. Pour batter into prepared pan and bake for 45 to 50 minutes or until golden brown and an inserted toothpick comes out clean. Remove from pan to cool. Note: This cake stays moist if wrapped tightly. I reduce the sugar to 1/2 cup and add the lemon juice. Combine all. Serve on biscuits, rolls, crackers, plain waffles or bagels, winter squash, brown rice etc. What to do with beets. In my bathrobe while I was making morning tea out of the corner of my eye I saw cows dashing across the yard heading towards the road. Running with total disregard to proper dress only checking to make sure nothing was showing I went running down the road after the cows hoping to get in front of them to turn them around. Fortunately traffic came to a halt and a car stopped their path by turning his car perpendicular to the road. Once the cows turned around we moved them slowly back towards home into the yard and into their pasture. The garden remained untouched. Their footprints led to a damaged fence. Oops their was a place in the fence that was not as secure as it should have been and behind it was a wild apple tree loaded with tempting desert. The higher they reached the more they broke the fence. I would sure loved to have blamed it on hunters, deer runting season or even the hot air balloon that flies too low startling the cows, but not this time. Cut each zucchini into 16 sticks. (cut in half, each 1/2 makes 8 sticks). Mix wheat germ almonds, cheese , salt and rosemary . Coat zucchini sticks with butter, then coat with wheat germ mixture. Lay on ungreased cookie sheet. Bake at 350 degrees until crisp about 15 minutes. Preheat oven to 350 degrees. Prepare pans for 12 muffins with cupcake papers or grease. Stir together flour, baking powder, sugar, salt and pepper. In a small bowl combine 1/4 cup cheddar and 2T parmesan. Set aside for topping. Stir remaining cheeses into flour mixture. Add onions and zucchini.. In another bowl mix eggs, milk and oil. Add to flour mixture stirring just until moistened. Batter will be very thick. Spoon into muffin pans and sprinkle with reserved cheese mixture. Bake for 16 minutes and poke with toothpick. If its clean, you’re done. If not bake for 5 minutes more and check again. Repeat if necessary. When done, remove from muffin tins and cool on wire rack. The baking time depends on how juicy your zucchini’s are. These muffins are heavy and moist. Cook beans in boiling salted water until crisp tender 2-4 min. drain immerse in ice water. Drain again and let stand dry. Melt butter in skillet, stir in onions and cook slowly until very wilted and deepened in color, about 15 min. Boil stock in a sauce pan until reduced to 1/4 cup; stir in sugar and vinegar . Stir in onions. Simmer until slightly reduced . Combine onions and green beans ; heat through. Season with salt and pepper. Recipe from A-Z cook book! Wash all vegetable and cut into chunks. Place in steamer over boiling water; steam until very soft. Using the water from the steamer, and any other stock or water as needed, blend cooked vegetables until very smooth and thick. Return to pot; heat gently to avoid sticking. Add salt and pepper. Serve each bowl with a generous portion of yogurt in center of soup. Make 4-6 servings. From the A-Z cookbook! Bring 2 quarts of salted water to a boil. Add kale, reduce heat to simmer, cover and cook 7 min. Darin and immediately rinse in cold water to stop cooking. Squeeze water out of greens. Heat oil in same pot. Add garlic and red pepper flakes . Saute 1 min., then stir in kale and broth. Simmer 4-5 min. Makes 4-6 servings. Here is a recipe from Dr. Chase’s Cookbook published in 1908. Try to imagine what life was like in 1908 very few people had electricity, most people used horse & buggy, they cooked on wood stoves, in the country you would be pumping the water with a hand pump. Most houses probably only had a few books. For writing they used fountain pens and pencils weren’t invented yet. Obviously no television, radio or internet. Although there are general instructions that ought to enable any one to prepare a salad for a chicken, yet, as there are some people who can only work upon specific or positive directions, I will give one so explicit and plain that none can go amiss: Take a good sized spring chicken, weighing 2 1/2 or 3 lbs. ; boil it till perfectly tender. When perfectly cold, pick the meat from the bones, and if the skin is at all tough remove it, and chop the meat to the size of peas; also, if you have it, chop the white part of 4 or 5 heads of celery to the same fineness, and mix together just before serving, into which the dressing which has been made in the following manner is to be mixed: Rub the yoks of 2 hard-boiled eggs smooth with 1 tea-spoonful each of mustard and salt, 2 tea-spoonsfuls of sweet oil or melted butter; 3 tea-spoonfuls of good vinegar, and if you like cayenne, as much as will take up upon half the length of a penknife blade; chop the whites of the eggs finely and mix in; then mix evenly into the chicken and celery mixture, or chicken alone if you have no celery mixture, and garnish with the green leaves of the celery or other sweet herds, as you like. *Please note the celery was probably much smaller heads in 1908. What to do with……. In this section, you will find various tidbits on what to do with almost anything to do with healthy living. Vibroacoustics and Vibroacoustic Therapy is a non-medical system that provides cellular stimulation through vibration to the cells of the mind and body. This therapy delivers frequencies in a passive and non-invasive process that activates the brain and central nervous system with the specific intent of balancing, optimizing and harmonizing cells of the body and brain to a healthy state. Vibroacoustics is “the process of hearing sound vibrations through the body.” This is accomplished with special sound generators designed to transmit frequencies through the body with optimal psychological and physical impact. The relaxation response brings about decreased muscle tension, a lowered heart rate and blood pressure, a deeper breathing pattern, calming of the stomach, and a peaceful, pleasant mood. as was reported on CNN – Dec.17, 2004. Gentle Vibrations can build bone mass and reduce fat. Kalamazoo Michigan was known as the celery capital of the U.S. for over 50 years thanks to a dutch immigrant who turned the abundant marsh area into acres of celery. Dutch wooden shoes were used to keep the farmers and also their horses from sinking into the rich muck. Only one ounce of seed is needed to plant a whole acre of land. The whole plant is tasty and nutritious. The leaves, rich in vitamin C, can be used like lettuce on a ham sandwich as well as for flavoring soups. A trick for keeping celery fresh is to cut it from the root and put all the stalks in a jar of water like a bouquet of flowers. Kept at room temperature or cold , even “tired” stalks perk right up. This soup is both tasty and colorful. 2 T cilantro, dried or fresh. Note: sweet potatoes can be substituted for squash.